As we step into the bull ring, the crowd roars. The bull, already snorting and thumping the ground is calling you to arms. However you’re not the brave matador you expect to be, you aren’t dressed ready for ceremonial battle in the Traje De Luces. You’re not even a fighter. You are anything but. Still bleary eyed and shaking off the last remnants of sleep, you’ve walked straight into the bull ring instead of the bathroom. The bull lurches forward and steams straight at you. The crowd cheers. You don’t dodge to avoid his sharp horns; instead you get gouged in the leg. Bleeding, you wonder what’s going on and them bam! The bull tears into you again. The crowd cheers with each mighty blow. But soon they get a sense that what they’ve come to see isn’t going to eventuate. You’re laying there pitiful and lame not even able to crawl away from the onslaught of attack after attack. The bull now picks you up with one its great horns and tosses you across the ring. You land like a ragdoll, crumpled up in the dirt. The crowd, no longer anticipating a brave comeback, goes quiet and then starts to hurl abuse and accusations of being weak and pathetic. You’re an embarrassment. Lying there in the dirt and blood, you start to believe them. You close your eyes and die. And before you…. the bull stands ready. Every morning we step into the bull ring of our mind. We are the bull, the crowd and the little fighter all rolled into one. We attack ourselves with negative self destructive thoughts and we have no skills to fight them off, we’re not trained to. We are the crowd that criticises and judges ourselves because that’s what is expected and happens naturally. It just happens. But is it good for us? And then there is little us, blinding wandering in and allowing it all to happen because we’re conditioned to it. It’s the way it is. This is life. What would happen if you turned and walked out of the bull ring? Does your mind have to be a battle ground? Who are you doing battle with? Turn around and walk out of the ring, through the gates into the grassy fields where the bright sunshine radiates all around you. The flowers burst with joy and the grass is soft under your tired feet. And the ground is always there to support you. You can never fall. You let go of everything, surrender to the beauty of the moment. What peace! As you let go and lie naked to the world, something starts to happen. Your vision changes, you don’t just see with your eyes, you can see with all your senses and everything become alive. Radiant. Without the mental anguish, you’re seeing through your heart, the openness, the bigness, the wowness of everything is raining down on you. And you don’t miss the old battle scared you for one moment. You quickly think back to the bullring and you can’t believe that was your life before. How crazy we are. 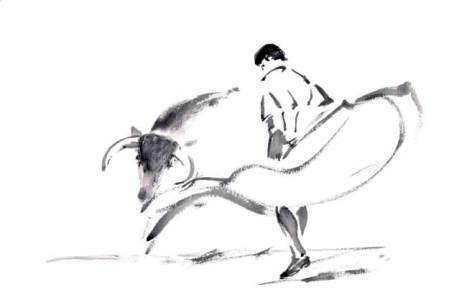 I note that back in September I had a dream and in my dream journal I wrote: Don Quixote refuses to engage the bull and rides out of the Arena and away.